When you look at the construction of the current Minnesota Wild roster you can separate the majority of the players into two categories: established veterans and young veterans. Typically a team will invest significant time and resources into its young players with the goal of having them develop into future core pieces. This applies even more so to players selected fairly high in the NHL draft as their expectations are almost automatically greater than those placed on late round picks or undrafted free agents. In terms of production, an NHL team would generally like to see their higher ceiling forwards take the next step in their development and breakthrough offensively by their fourth or fifth professional season. Focusing specifically on the Wild’s current forward group, there are three players in particular who stand out as being individuals who could be in line for breakout seasons in 2016-17. Coincidentally, all three of these players are former first round draft picks chosen in the same year and each one of them has experienced comparable career trajectories up to this point. It would be an understatement to say that it would provide a huge boost to Bruce Boudreau and the Wild if even one or two of these three players can further elevate their games and establish themselves as legitimate first line caliber forwards this season. 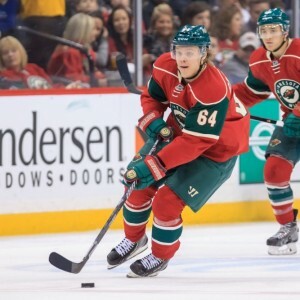 Seen as a surefire future star when he was drafted 9th overall in the 2010 NHL Entry Draft, Mikael Granlund’s road to becoming one of the league’s top point producers has taken longer than originally anticipated. The 5’10” centre was widely seen as one of the top players outside the NHL in 2011-12 after he led his SM-liiga team in scoring with 51 points in 45 games at the ripe age of 20. The Finnish forward also saw his fair share of success representing his country at multiple international events, most famously at the World Juniors and World Championships, prior to finally making his North American debut in 2012-13. Granlund adjusted well to the smaller ice surface while playing at the AHL level where he scored at near a point-per-game clip through 29 contests; however, as should be expected, the creative forward saw his production fall well short of that pace during an extended stay on the NHL roster in his rookie year. Size, shot and high-end speed have long been the major concerns in Granlund’s game but he does a good job of compensating for his weaknesses with his high skill level and hockey IQ. To date, the forward has been given plenty of opportunities to succeed as he’s received an increase in ice time and higher offensive zone starts in each of the past three seasons. As a result, Granlund has seen a dramatic increase in his shot totals but, quite alarmingly, has also seen his points-per-60 decrease over that same period of time. Entering a season in which he will turn 25-years of age, it is fair to say that the 2016-17 campaign is a crucial one for Granlund. An experienced offensive minded coach like Boudreau might be just what the doctor ordered though as Granlund is expected to start the season on a line with team captain Mikko Koivu and another member of the 2010 NHL Draft class in Jason Zucker. Will Granlund finally take advantage of the opportunities being handed to him and reward his team with bigger offensive numbers or will he continue to stagnate and become a career a 35-45 point producer? Drafted four slots higher than teammate Granlund, Swiss-born Nino Niederreiter has the size to go along with his high skill level. The 6’2” right winger is entering his sixth professional season but essentially wasted a full year of development at age 19 when he fell victim to the NHL-CHL Transfer Agreement. The New York Islanders kept Niederreiter on the roster despite substantive evidence that he was not yet ready to play in the world’s best league. Niederreiter would score an abysmal one goal and zero assists while dressing for 55 games in his rookie year and then spent the next full season toiling in the AHL with the Bridgeport Sound Tigers before asking to be traded. Since joining the Wild in the summer of 2013, Niederreiter has posted consecutive seasons of 36, 37, and 43 points while also seeing slight increases in his shot totals and ice time year-over-year. His average TOI of 15:33 this past year represents a career high and the big winger could be poised to surpass that number depending on the linemates and power play time he receives from coach Boudreau this upcoming season. The two-time 20-goal scorer closed out the season strong as he registered six points in six playoff games before the Wild were eliminated by the Dallas Stars in the first round. He will no doubt be looking to build off his late-season success and use it as motivation to establish himself as one of the league’s premiere power forwards. Niederreiter is definitely a player to watch for the 2016-17 season. Another 1992 born forward, Charlie Coyle was drafted by the San Jose Sharks with the 28th overall pick in 2010 prior to being traded to the Wild a year later as a key part of the deal that sent Brent Burns to California. The Massachusetts native he has been working hard at making a name for himself ever since and looks poised for a big year. The versatile forward has shown glimpses of an effective power game to go along with a scoring touch around the net. Coyle displays his strong work ethic on a nightly basis as he consistently wins boards battles and is extremely difficult to knock off the puck. Coyle has been impressive enough in his career thus far as he has evidently caught the eye of opposing teams around the league. Coach Boudreau, for one, had nothing but praise for the 6’3” winger and has publicly stated his intentions to start him on Minnesota’s top line with veteran scorer Zach Parise and the team’s biggest offseason acquisition Eric Staal. The young veteran of 271 regular season games potted 21 goals a year ago but did so while shooting an unsustainable 15%. Starting the season alongside Parise and Staal, Coyle should fittingly play the role of puck retriever and will presumably be in line to receive a nice boost in ice time. This should, in turn, provide the forward with a greater opportunity than he’s had in the past in terms of producing offense, but, it is ultimately up to the player himself to prove his coach right and to show the rest of the league that he belongs on a number one line. The opportunity has been earned and now it’s just a matter of waiting to see if he delivers. Minnesota has historically been a low-scoring team but with a new coach in place with a resume of success and these three players just itching to break out, things could soon change in the Gopher State. To date, these players have all shown various glimpses of promise and the ability to score at rates expected from second line forwards. But the question remains: do they have what it takes to reach that coveted next step?